* The new imperative for business success is managing attention. Internet traffic doubles every 100 days. Nearly 200 messages flood managers’ desktops daily. Welcome to the attention economy in which the new scarce resource isn’t ideas or even talent, but attention itself. Businesses are headed for disaster unless they can over-come the dangerously high attention deficits that threaten to cripple today’s workplace. * In the present economy, capital, labor, information, and knowledge are all in plentiful supply. It is easy to start a business, get access to customers and markets, develop a strategy, develop a web site, and design advertisements. What is in critical short supply is human attention. * Vast amounts of information are available at one’s fingertips, but no one will be informed by it, learn from it, or act upon it unless they have pre-attention to devote to the information. 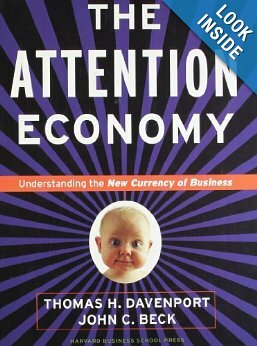 * Attention is the real currency of business and individuals. It has many of the same attributes as money. Those who don’t have it want it. Those who have it want it even more. You can trade it, you can purchase it, and people work to preserve and extend what they already have. This is why caller ID devices and email-filtering software are so popular. People want to screen out that which diverts their attention.